Research — Haider Ali Ph.D. The material here relates to various projects in social marketing and coproduction. Social marketing deals with behaviour change. The projects I have been involved with focus on encouraging healthier lifestyles. Coproduction of social services involves the partnering of statutory organisations such as hospitals with local community groups. My interest is in the marketing processes that facilitate such processes. This is a Rafflesia flower, Gunung Gading National Park, Sarawak, Malaysia. Faith leaders and workers and people in statutory organisations such as NHS Trusts are increasingly working together for the delivery of services and undertaking social marketing / health promotion campaigns. I am interested in two key managerial areas, social marketing and co-production, and the possible role that religion can play in the delivery of social marketing campaigns and co-production initiatives. The material in the sections that follow, appears in the following order. Social Cooking - this was sponsored by the Food Standards Agency and the British Heart Foundation and the goal was to reduce levels of salt and fat used in congregational cooking in Hindu Temples and Sikh gurdwaras in various locations in the UK. HeartNet was a social marketing project dealing with the social support issues faced by south Asian cardiac patients. The output comprised a series of case studies that could be used to encourage discussion of the issues amongst south Asians. The Healthy Ramadan project was undertaken by the British Heart Foundation over a period of several years and I undertook evaluations of it. The project sought to encourage Muslims to undertake positive lifestyle changes during the month of fasting. Faith leaders and workers project - this was sponsored by Communities and Local Government (CLG) and our role was to evaluate its impact. The goal of the project was to improve standards of management and governance amongst faith leaders and workers. My research is designed to understand such work and the research outcomes are supposed to help improve the ways in which such people and organisations can co-operate. The Provider Site Initiative - developed by Wandsworth Community Empowerment Network (WCEN). Family Therapy Project - delivering family therapy through church pastors. At the bottom of this page is a list of my publications. The British Heart Foundation and the Food Standards Agency sought to encourage the preparation of healthier meals and this was undertaken as part of their 'Social Cooking' project. Further details on the left of this page. People of South Asian origin (people with ancestry from India, Pakistan, Bangladesh and Sri Lanka), have a higher propensity to CHD than the UK population in general (Wild & McKeigue 1997). Furthermore there are also evidences suggesting a higher prevalence of cardiac risk factors (such as insulin resistance, diabetes and high cholesterol) and cardiac risk prone behaviours (such as, obesity, low physical activity, smoking and high fat diet) among this population. The lower levels of knowledge and understanding of CHD risk factors in these communities compound this problem (Datta 1995). There is also a lower level of uptake of services within these communities (Mc Keigh & Miller 1998) and compliance with drugs regimes. In particular research shows that the first generation of immigrants have higher levels of mortality attributed to heart disease than other population groups (Balarajan 1996). Given the problems faced by this minority ethnic group, the purpose of this research has been to gather insights into the way in which social support is provided by friends and relatives to cardiac patients of South Asian origin. In particular we have focused on South Asians of Urdu speaking origin, who are originally from Pakistan. For this research we have also gathered data from other ethnic groups in order to throw into sharper relief how Asian cultural norms may have changed or adapted to the British context. Social support is supposed to be protective of cardiovascular health. This is supported in cross-sectional and longitudinal population studies, in intervention studies with humans and animal experiments (Kristina Orth-Gomer 1994). In multivariate analyses controlling for standard risk factors (blood pressure, lipids, coagulation factors, family history, sedentary lifestyle, etc.) two factors emerged as the strongest independent risk factors for MI in middle aged men: smoking and lack of social support (Orth-Gomer, Rosengren and Wilhelmsen 1993). This was the first study to prospectively link social support to the occurrence of heart disease. Frequency of social contacts, the number of available persons and the amount of social activities seem to have a substantial effect on health and survival. If size and density of social networks have an effect on health this could be due to qualitative rather than quantitative characteristics of the social interaction. Also social interaction if improper could be a stressful factor in itself and may promote rather than inhibit illness. Recent studies have sought to develop qualitative measures that could tap into those aspects (Orth-Gomer & Unden A-L 1987). Stansfeld (1999) argues that a richness of analysis may be obtained by examining the quality of support as well as the social network. The following presentation was made to the European Marketing Academy Conference (2007) in Reykjavik. The messages to be delivered by the campaign focused on the importance of managing salt consumption within an overall healthy lifestyle that includes stopping smoking and reducing fat consumption. By delivering a prominent message about salt consumption within the framework of a wider campaign the aim of the campaign was to deliver the salt message to a wider range of people, using a wider variety of media than would otherwise be possible. The target for this campaign were Muslim communities, these are people originally from the following countries, Bangladesh, Pakistan, India, Afghanistan, Turkey, Iran, Algeria and a significant number of African and Afro-Caribbean people. It has been estimated that there are about 1.5m Muslims living in Britain, about two thirds of whom are of South Asian origin (Weller 1993). Pakistani, Bangladeshi, Turkish, Kurdish and Somali communities form the majority of the Muslims communities in the UK and they are also most deprived. One of the drivers behind the campaign was the relatively high levels of smoking in various Muslim communities in the UK. A presentation linked to this work is here. This was a training programme (sponsored by CLG - (a UK government department) aimed at faith leaders and workers and the social marketing element was the emphasis on encouraging interfaith dialogue and better governance in places of worship as a means of combating extremism. My colleagues and i assessed the programme and the report can be accessed here. The work on co-production deals with various initiatives undertaken by the Wandsworth Community Empowerment Network. The first of these, is a presentation dealing with the collaboration between a Hindu Temple and the local mental health trust. A Community Based Participatory Research perspective was used in order to examine the relationship. The second presentation deals with a broader investigation into the role of local community organisations in the delivery of social services. The following presentation is based on observations of meetings between local community groups and statutory organisations such as local health service providers. The presentation deals with the motivations that organisations have in participating in a 'Provider Site Initiative'. The presentation starts with a coverage of the drivers encouraging collaboration and proceeds to deal with the benefits to both types of organisations. Michaelidou, N, Dibb, S, and Ali, HA (forthcoming 2011) 'The impact of antismoking information on teenagers' attitude and intention: implications and challenges for designing anti-smoking school interventions', Journal of Strategic Marketing. 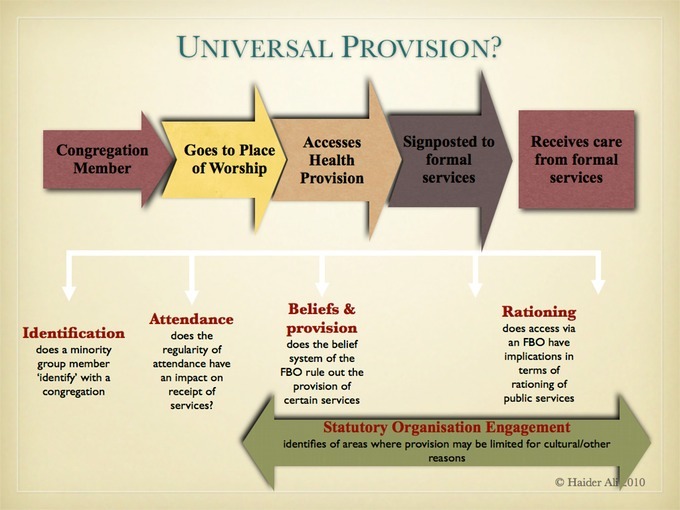 Paton, R, Ali, HA, and Taylor, SL (2009) 'Government support for faith-based organizations: the case of a development programme for faith leaders', Public Money and Management, vol. 29, no. 6, pp. 363-370. Michaelidou, N, Dibb, S, and Ali, HA (2008) 'The effect of health, cosmetic and social antismoking information themes on adolescents' beliefs about smoking', International Journal of Advertising, vol. 27, no. 2, pp. 235-250. Ali, HA, and Birley, S (1999) 'Integrating deductive and inductive approaches in a study of new ventures and customer perceived risk', Qualitative Market Research: an international journal, vol. 2, no. 2, pp. 103-110. Ali, HA, and Birley, S (1998) 'The role of trust in the marketing activities of entrepreneurs establishing new ventures',Journal of Marketing Management, vol. 14, no. 7, pp. 749-763. Ali, HA (1995) 'Gateways to market entry', Journal of Entrepreneurship, vol. 4, no. 1, pp. 49-69. Ali, HA (1994) 'The value of trust in service sector marketing', In: Armistead, C (ed.) The Future of Services Management, London, Kogan Page. Paton, R, Taylor, SL, and Ali, HA (2009) 'Faith Leaders and Workers Project: Evaluation Report', London, Communities and Local Government. Zaidi, Q, Govindji, A, and Ali, HA (2008) 'Social Cooking Project', Report commissioned by Food Standards Agency. Ali, HA (2006) 'HeartNet Preliminary Report', Report commissioned by the British Heart Foundation. Ali, HA (2004) 'Evaluation of smoking prevention presentations in schools', Report commissioned by QUIT. Ali, HA (2003) 'Evaluation of CHD training for health advocacy and bi-lingual link workers in South Asian communities',Report commissioned by the British Heart Foundation. Ali, HA (2003) 'Evaluation of smoking cessation counselling groups', Report commissioned by QUIT. Ali, HA, and Anselmo, P (1998) Women's perceptions of their role portrayals in print adverts: a qualitative study, Cranfield School of Management Working Paper; no. SWP 17/98. Ali, HA (2008) 'Social marketing to a minority community - developing communication narratives that resonate', Global Marketing Conference, Shanghai, China 20-23 March. Ali, HA, and Lindridge, AM (2007) 'Cultural sensitivity and its implications for social support in social marketing: the case of British Pakistani and British white cardiac attack patients', 36th European Marketing Academy Conference , Reykjavik University, Iceland, 22-25 May. Dibb, S, Michaelidou, N, and Ali, HA (2007) 'Smoking prevention in adolescents: the efficacy and ethics of fear-based messages', European Marketing Academy Conference, Reykjavik, Iceland, 22-25 May. Michaelidou, N, Ali, HA, and Dibb, S (2006) 'Understanding adolescent beliefs and intention to smoke: the effect of antismoking information', Advances in Consumer Research Conference, Sydney, July. Ali, HA, and Birley, S (1998) 'The role of trust in the marketing activities of entrepreneurs establishing new ventures', Academy of Marketing Conference, Sheffield. Ali, HA, and Birley, S (1994) 'Searching for risk and trust in new venture marketing', American Marketing Association. INSEAD, France. Ali, HA (1993) 'Marketing through network leverage', Babson Entrepreneurship Conference, University of Houston, USA. Ali, HA (1992) 'Networking - a marketing tool for the self-employed', 15th Small Firms Policy & Research Conference, Southampton, UK. Ali, HA (1992) 'Networking - an element of the small business marketing mix - background and theoretical considerations', 22nd European Small Business Seminar, Amsterdam, Holland. Ali, HA (2010) Why people buy counterfeit brands [online], Blog for the BBC's The Money Programme, Available from: URL (http://www.open.ac.uk/openlearn/history-the-arts/culture/media-studies/tele-wars-the-next-chapter ), (17 February). Ali, HA (2006) The lure of the ready meal [online], Blog for OpenLearn, Available from: URL (http://www.open.ac.uk/openlearn/money-management/management/business-studies/the-lure-the-ready-meal ), (6 Oct). I have also written comments on various publicly listed companies which can be found here.